TALLAHASSEE, Fla. – The Florida Department of Highway Safety and Motor Vehicles (FLHSMV) is urging customers to use its safe, secure and convenient resources when renewing or replacing a Florida driver license, ID card or registration online. There are other sites which offer customers the option of renewing online, but customers should be aware of additional, and sometimes excessive, convenience fees. When using GoRenew.com, the department charges a $2.00 convenience fee applied to the total transaction. For an entire list of driver license and motor vehicle fees, click here. Update the address on your driver license or ID card. Replace a lost or stolen credential. Register or update emergency contact information. Customers can check the status of their Florida driver license and provide online insurance updates through the department’s DL Check. One or two-year registration renewals for motor vehicles. One or two-year registration renewals for vessels. Obtain a duplicate registration if the customers registration is lost. Customers using GoRenew.com to renew a registration online will receive their registration in the mail. Customers can receive an emailed confirmation receipt that can be used until the registration arrives. FLHSMV also offers its mobile app, MyFlorida, where customers can renew up to five vehicles and/or vessels in one transaction for a period of one or two years with only one processing fee. MyFlorida is available for free download on all mobile devices through iTunes and Google Play and allows customers to securely renew a registration on an eligible vehicle or vessel. Customers will receive a digital document to use until the registration arrives in the mail. A $4.00 processing fee is applied to each transaction for customers paying with credit card, or $3.75 for transactions paid through checking account. To learn more about renewing or replacing your Florida driver license or ID card, visit: https://www.flhsmv.gov/driver-licenses-id-cards/renew-or-replace-your-florida-driver-license-or-id-card/. 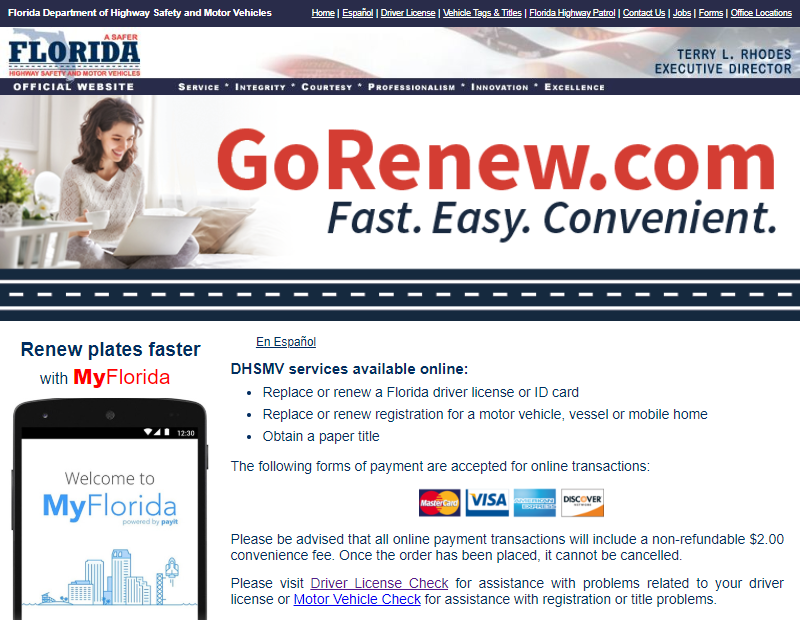 To learn more about renewing or replacing your Florida registration, visit https://www.flhsmv.gov/motor-vehicles-tags-titles/license-plates-registration/renew-replace-registration/. The Florida Department of Highway Safety and Motor Vehicles provides highway safety and security through excellence in service, education and enforcement. The Department is leading the way to a safer Florida through the efficient and professional execution of its core mission: the issuance of driver licenses, vehicle tags and titles and operation of the Florida Highway Patrol. To learn more about FLHSMV and the services offered, visit www.flhsmv.gov, follow us on Twitter @FLHSMV or find us on Facebook and Instagram.